Goodreads Summary: Allie lost everything the night her boyfriend, Trip, died in a horrible car accident—including her memory of the event. As their small town mourns his death, Allie is afraid to remember because doing so means delving into what she’s kept hidden for so long: the horrible reality of their abusive relationship. I was drawn to this book for the cover, especially the phrase on it: "Does time heal all wounds?" After reading the synopsis, I knew that this would be an emotional book, but I didn't realize just how many aspects of life this book would touch. 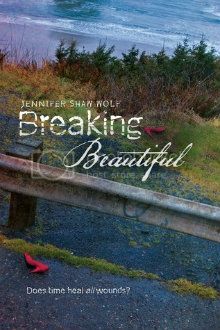 Breaking Beautiful does have an element of mystery and suspense, but what really makes this book are the characters. Although it was difficult to connect with Allie at first because she was so numb, as the story progressed, her thoughts and feelings became much more clear. I appreciated seeing the flashbacks of the night of the accident, as well as other times with Trip, as she came to remember them; these scenes really added to the story. I loved her relationship with Andrew; they were friends and tried to protect and care for each other rather than being simply bickering siblings. I also enjoyed Blake's character - who could help but fall for the tortured artist who clearly cared so much for Allie? He evoked almost as much sympathy as Allie, in his own way. Finally, I really liked Caitlyn's character and what she stood for. Throughout the book, Allie, Blake, Andrew, and Caitlyn could all be seen as victims in their own different ways, reminding us that everyone has their own burdens to bear and has to find their own ways to overcome them. This book may have dealt with heavy, serious topics, but there were moments of startling normalcy and lightheartedness scattered throughout the story that relieved the tension and allowed me to really connect with the characters. After finishing the book, I have to admit that I am conflicted about one detail of the ending. Even though I understand why things happened the way they did, I wonder what the consequences might have been of that decision. Breaking Beautiful is certainly a worthwhile read, full of meaning and important messages. I will look forward to reading more from Jennifer Shaw Wolf!